It's been a while since I posted but I check in occasionally. This site holds a lot of memories for me too. I could tell from the start based on the development progress that this game would never get finished and if it ever did it would get shut down pretty much immediately by Nintendo, so I stuck around for the community on the forums. I met a lot of cool people through this website, joined a league team with the developers Urmel and Dark, contributed to the game in a small way, participated and casted the forum tournament, and enjoyed my time here. I'm not dead, also not a fan of soppy messages. Though ive made a total of.. twenty two posts? thought it was less then that.. this place was still a great place to stop by and see what was going on with everyone and although i didn't really get to know many or really any of you, i know that all of you are amazing people. It's sad to see this place start to go into its eternal slumber after seven years, maybe one day someone will take up the passion that was and is still here. Though this may be the end phases of this site as a pokemon game thing, i hope to see the beginning phases of this site being reborn or hatching from its old cocoon of a metapod that was once baby caterpie into a wonderful Butterfree. What type of Butterfree will this site turn into i wonder, i hope to find out in the future. To all those who worked on PU, thank you for all of you volunteered hours on this game, site and forums. Who knows what the future holds, only time will tell. Hope to see you all in the future and get to know you all. Well then. This is quite interesting to come across. Not sure what to say but I guess I'll just say that I wish college hadn't made me disappear from this wonderful community. I enjoyed the year or so I was active on here and was very happy to be involved with starting the RP section on this board. I have wonderful memories of sitting on irc during highschool and just chatting and learning pixel art. Bit of an update on me. I now work on my own game design on the side of my career job and graduated with a degree in 3d modeling and design. Never Underestimate the Kindness of other Humans. Ohh nice. Good luck with that Are you able to like, reproduce the latest pokemon 3d models? Of course I could also likely just download them from various websites and mess with the ones officially used in games. Oh okies. 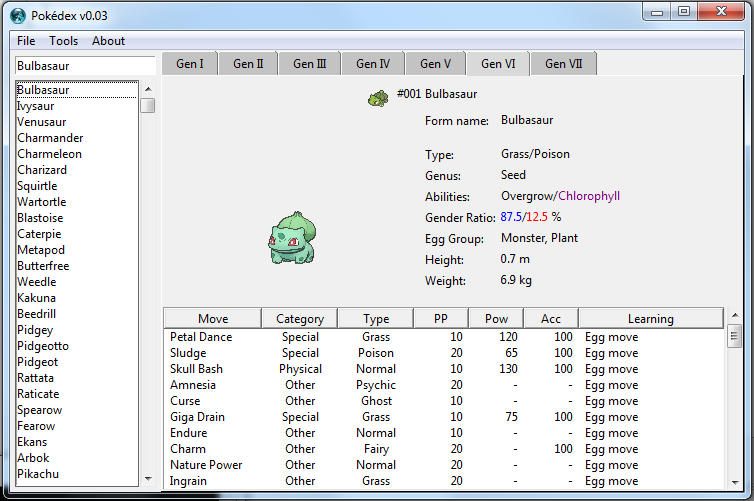 I'm coding a pokedex app (windows for now, not sure if it can cross platform but I believe it can with a few tweaks) in my spare time. The source is here. You can leave a message here or there if you want to contribute ^^ I mostly need help with the art at the moment though. What exactly are you looking to do? Get the game's models and put them into your pokedex? Or brand new, non nintendo owned models?